Let’s get one thing straight: this isn’t a ra-ra pro-natural birth post. The way you choose to deliver your babies is entirely up to you and no-one has a right to judge you for it. You’re an absolute rock star. But if you’re expecting twins, you might believe that a vaginal birth simply isn’t an option. Your medical team has probably counselled you to have an epidural or a caesarean because there’s a “higher chance of complications with twin births”. Those words are enough to scare any mama-to-be – who would want to take any risks with their unborn children’s lives? Because I’d had such an easy natural birth with my first daughter (no epidural, just gas), I was keen to repeat the experience when I had my second child. But then my second child turned out to be two children. Two more little girls, to be precise. And guess what my rotating team of public-system obstetricians told me? Well, they had wildly different opinions on many aspects of my pregnancy, but they all seemed to agree that I should have an epidural at the very least. Some even suggested an elective caesar to eliminate all risk – even though I was on the “low-risk” end of the twin pregnancy spectrum. The over-medicalisation of the whole process freaked me out. So, I did a little research and this is what I found. 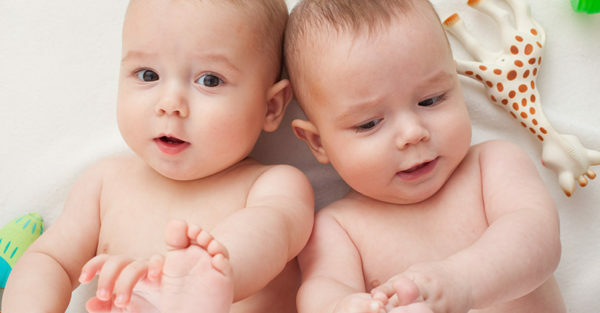 French researchers who studied nearly 6000 twin births found that twins who were born vaginally had fewer complications and were less likely to die than those who were born by caesarean. If your FIRST twin is in a head-down position, the study’s authors recommend that you attempt a vaginal delivery regardless of the position of your second twin. The American College of Obstetricians and Gynecologists (ACOG) agrees. But despite these universal recommendations, only 31 percent of twins are delivered vaginally in Australia compared to 67 percent of singletons. Of course, some twin pregnancies carry complications that require a caesarean, such as a breech first twin or placenta praevia (low-lying placenta). And if your twins are identical and share a placenta, chances of a caesar are also much higher. But plenty of women who could safely deliver their twins vaginally never even consider the option because medical professionals steer them straight towards a c-section. Two obstetricians who perform natural twin births have told me under the cover of anonymity that many of their colleagues won’t go there because they’re afraid of being sued if anything goes wrong. The risks are just too high, so they direct their clients to the operating table where they cover their butts and get it over with much faster than if they had to perform long-winded vaginal births. Yikes. The good news is that having a vaginal twin birth – without or without epidural – is entirely possible. You just have to do your research. I started by ditching my inconsistent team of public-system obstetricians and found a private OB who was well-versed in vaginal twin deliveries. I’m usually a big fan of the public system, but I wanted to ensure my fate wasn’t left at the mercy of a bunch of docs who didn’t agree or even communicate with each other. Then, I “interviewed” my new friend to ensure he was comfortable with my master plan. He was 100 percent on board, but he made it clear that I could kiss my natural birth goodbye if my first twin was breech. I was totally cool with that because the safety of my babies was number one. As the big day approached, I started to get cold feet. “Doc, maybe it’s safer to just have an epi, yeah?” I asked hopefully. “Nup, you’re looking good, Sabrina!” he clapped. “Both babies are head down – you’ve got this!” Gulp. At 36 weeks, my doc decided to induce me because one of the twins had stopped growing and he was concerned. Nothing happened when he gave me oxytocin, so he manually broke my waters before stepping out to perform a “quick caesar”. I sucked on the gas like a mofo as the contractions came hard and fast. I’m not trying to make myself out to be a hero here. During both my deliveries, I deliriously begged for an epidural at the eleventh hour (too late, both times). But I freaking loved my natural births because they were super empowering, and I’d love to see more women given the tools and confidence to try it too. So, if a natural twin birth is something you’d like to pursue (and the medical conditions are right), find an obstetrician whose views are in line with yours. Ask plenty of questions to make sure they’ll support your wishes. If you’re in the public system, you might need to be a little pushy to get your way, but you can still get there. Vag for the win!